Buddy Dyer supports a proposal that claims ‘low income’ is a major cause for the need of 'affordable housing.' And, even though ‘low income’ is a real cause for the affordable housing need, Mayor Dyer does not address this problem or offer a pliable solution. 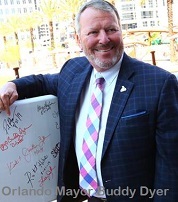 Buddy Dyer has an agenda that is not good for the people of Orlando. As Mayor of the City of Orlando, Aretha Simons will be honest and truthful with the residents. Aretha will engage citizen groups and individuals to identify problems. She will always submit ideas which contain a sustainable solution. Aretha Simons has a plan.